that if you listen closely you hear the holy spirit speak. 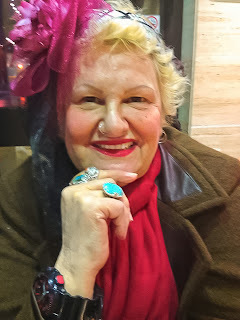 Hello, I am an inspirational psychic and teacher, working to the glory of God and the Lord Jesus Christ with prophecy to deliver messages of healing for your future. Please see the Contact Page for contact information, or view the Testimonials Page to see what my clients have to say about my services. 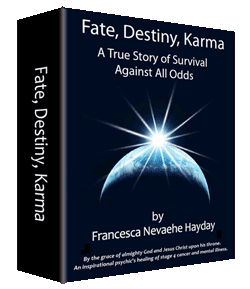 You can also read more about my book, Fate, Destiny, Karma: A True Story of Survival Against All Odds, coming in February 2014 from XLibris. My personal blog is The New Daily Hayday. Francesa Nevaehe Hayday is a strong woman of leadership and integrity. --Mohamed, from Morocco I intuitively trust her visions for my future, which always prove to be accurate. --Haitham, from Egypt Gives a high quality, accurate reading that gives you peace of mind as well as information about the future. (c) FRANCESA NEVAEHE HAYDAY. Awesome Inc. theme. Powered by Blogger.